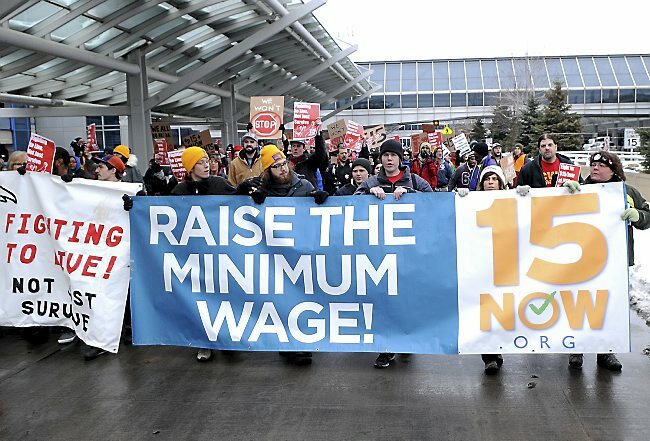 On Monday, we took to the streets demanding a $15 minimum wage with no carve-outs or exemptions in Saint Paul. Low-wage workers and community supporters spoke about the effects of poverty on our communities. Faith leaders gave moral witness and called for decisive leadership from elected officials. And 15 people were arrested in an act of civil disobedience demanding $15 One Fair Wage. Why do we march? With Mayor Melvin Carter committed to passing $15 by the end of the year, is it really necessary for hundreds of people to take to the streets demanding a $15 minimum wage with no carve-outs? Public, grassroots, highly visible direct action is the fundamental way we change the political landscape and win. When fast food workers in New York first raised the demand for $15, they didn’t gain traction through backroom deals or expensive lobbying. They gained power through strikes, pickets, and marches just like ours. Workers in Minneapolis did the same thing-- through mobilizing into the streets over and over again, we transformed the political landscape. Corporations have big bucks, but we have people power. They’re using their power and influence to weaken, delay, and carve-out $15 as much as possible. When we march, we show policymakers that working people call the shots-- and we aren’t afraid to fight for our needs. Every successful workers rights struggle in history has involved working people organizing themselves to demonstrate in their workplaces and in the streets. That’s not a coincidence: rallies, strikes, and direct actions are the only way to overcome corporate power and win. Just like workers fighting for the 8-hour day or the weekend, we will need to continue mobilizing to hold policymakers accountable. That means Monday’s protest won’t be the last time this summer we take to the streets!